MANAGEMENT SOFTWARE in statuary compliance, we have the big- software does exactly what we want to gest network of of? ces – over 30 port customize,” Folan says. A client that of? ces and certi? ed 200 surveyors and wanted to move off paper and go digi- auditors – our af? liated group can help tal, wanted to see the product in action with SMS development and a dedicated ? rst. 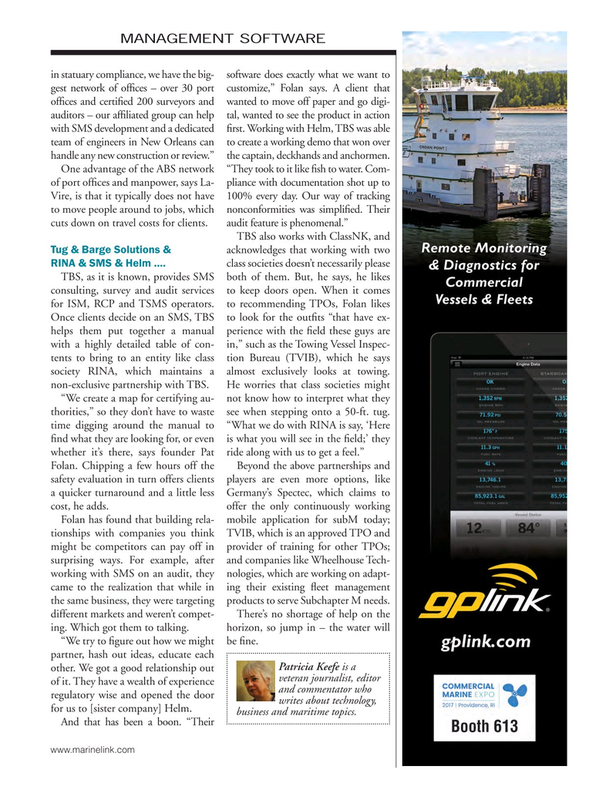 Working with Helm, TBS was able team of engineers in New Orleans can to create a working demo that won over handle any new construction or review.” the captain, deckhands and anchormen. Folan has found that building rela- mobile application for subM today; tionships with companies you think TVIB, which is an approved TPO and might be competitors can pay off in provider of training for other TPOs; surprising ways. For example, after and companies like Wheelhouse Tech- working with SMS on an audit, they nologies, which are working on adapt- came to the realization that while in ing their existing ? eet management the same business, they were targeting products to serve Subchapter M needs. different markets and weren’t compet- There’s no shortage of help on the ing. Which got them to talking. horizon, so jump in – the water will “We try to ? gure out how we might be ? ne. Patricia Keefe is a other. We got a good relationship out veteran journalist, editor of it. They have a wealth of experience and commentator who regulatory wise and opened the door writes about technology, for us to [sister company] Helm. business and maritime topics.